A soft anti-aging tissue which provides an instant filling and firming effect when applied to face, neck and décolletage. Incorporates a vegetable extract that stimulates the production of beta-endorphins. Tephrosia Purpurea extract, Marine Silanol, Sugar cane, Polylift moisturizer. 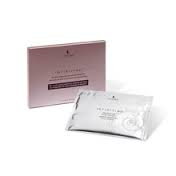 One pack of six sachets (1 sachet contains 1 mask for the face and neck and 1 for the décolletage. For an intensive treatment apply once a week for a month or each time the skin needs a boost. 2-Place the larger mask over the face making sure the tissue is perfectly adapted to the contours of the mouth, nose and eyes. 3-Gently press and smooth the tissue into position. 4-Leave the mask to work for 20 minutes while enjoying a moment of profound well-being.